New for 2010, the AL-KO Powerline range offers class leading machines full of innovative AL-KO features. The 4700BRV Powerline is a 46cm self propelled rotary mower with the new AL-KO Cockpit Concept to improve operator posture and comfort, with enhanced ergonomics and reduced vibration.Powered by an easy starting and powerful Briggs & Stratton DOV 750 Series engine, this model also benefits from the AL-KO 3INONE function – with collection, mulch, and rear discharge capabilities all from one value for money machine.The 4700BRV Premium also features AL-KO Highwheels for improved traction, and adjustable aluminium handles to improve operator posture and comfort.On AL-KO Powerline models, the ULTRAMOW steel deck features a conditional 5 year homeowner warranty, complete with robust aluminium lifting handle and bumper. 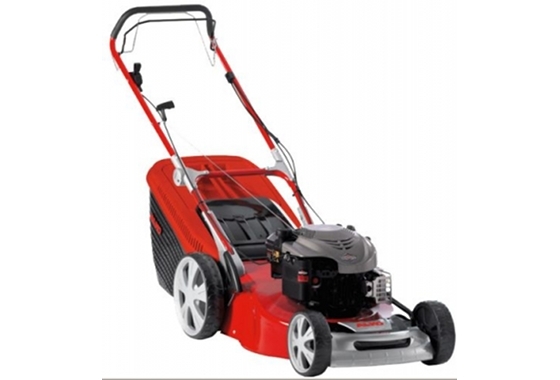 This model also features variable speed control for ease of use. ULTRAMOW steel deck: The cutter deck is pressed from a single sheet of steel for a flawless finish. This improves collection efficiency and longevity. All ULTRAMOW decks are supplied with a 5 year conditional warranty. 3INONE function: Mow, collect, and mulch – all with a single machine. This model is supplied with a mulch kit as standard.